The CERGA Observatory (French: Centre de recherches en géodynamique et astrométrie; obs. code: 010) was a scientific department and astronomical station of the Côte d'Azur Observatory in southern France, where several asteroids were discovered during 1984–1993. CERGA included 28 researchers and as many engineers and technicians located on the Observatory sites of Nice, Grasse and Calern (Caussols). The scientific activities covered fields as diverse as fundamental astronomy, celestial mechanics, and space geodesy. CERGA was in charge of several observing facilities of the Lunar Laser Ranging experiment, for example, the lunar-laser ranging telescope and the two satellite laser stations. By nature the scientific activity involved the acquisition of data and their processing, a dedicated instrumental development and a close relationship with the more theoretical aspects in dynamics and observation modelling. 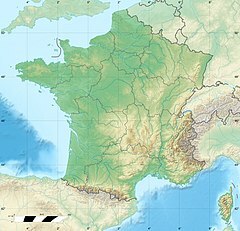 CERGA was dissolved in 2004 when the parent Côte d'Azur Observatory re-organized. The main-belt asteroid 2252 CERGA was named for the observatory, where this asteroid was discovered by Kōichirō Tomita. The Minor Planet Center directly credits the CREGA observatory with the discovery of 21 asteroids made during 1984–1993. The discoveries were made using the observatory's 0.9-meter Schmidt telescope. ^ a b c "Minor Planet Discoverers (by number)". Minor Planet Center. 12 January 2017. Retrieved 26 April 2018. ^ a b c "2252 CERGA (1978 VT)". Minor Planet Center. Retrieved 26 April 2018.